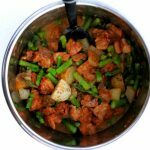 Moist bites of chicken, cubed potatoes and crisp bites of asparagus are tossed with a seasoning blend of smoked paprika, garlic powder and more to create a well seasoned one pot dinner. Wash potatoes and if you desire, peel them (I kept the peels on mine). Cut them into 1 inch cubes. Add them into the slow cooker. Use kitchen shears* to trim the excess fat off the chicken thighs. Cut the chicken into 1 inch chunks. Add the cut chicken into the slow cooker. Add salt, pepper, smoked paprika, garlic powder, onion powder, oregano and chili powder into the slow cooker. Use a spoon to toss the seasonings to coat the chicken and potatoes. Cover and cook on low for 4 hours, or until potatoes are tender. Remove the lid. Stir in the pieces of asparagus and put the lid back on. Let the pot sit for about 5 minutes to warm the asparagus through and slightly cook it. You can use broccoli in the place of asparagus. I would slightly steam the broccoli before adding it into the slow cooker.